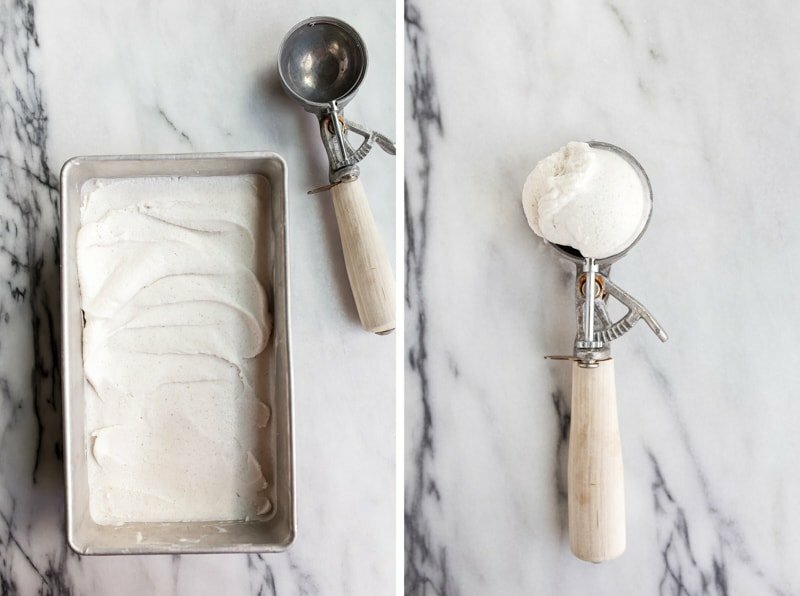 Coconut milk ice cream is your go-to summer dairy free ice cream recipe. Made with coconut milk and coconut cream, it’s thick and rich like regular ice cream. You won’t taste the difference! This post has been sponsored by Vital Proteins. 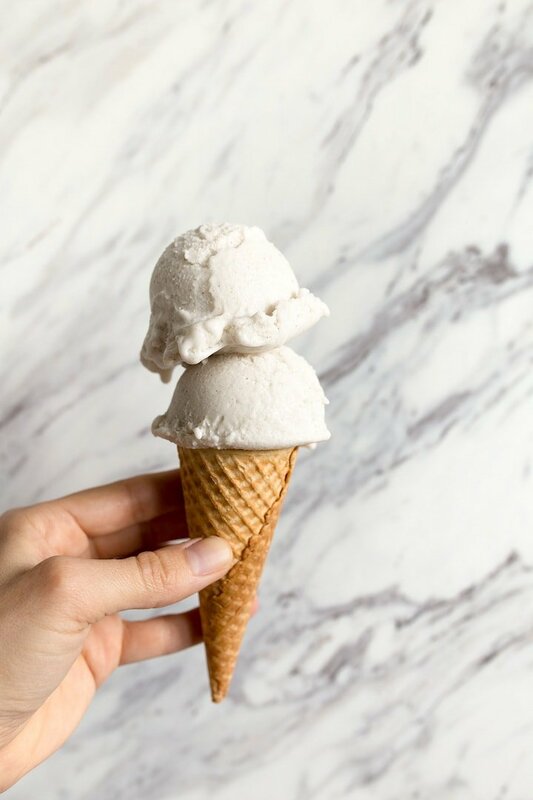 I’ve got your summertime go-to dairy free coconut milk ice cream recipe right here today. The truth is, we live in an allergy-friendly world these days. I realize this makes me sound old, but I remember times when I would host dinner parties without asking my guests about their allergies or dietary preferences. Now, my dinner party invites come with strict orders to inform me of your preferences. I want to know about your allergies, and I also want to know if you’re temporarily avoiding any food groups. The thing about feeding people (and loving to do so) is that the best way to do it is to please them. I don’t want you to blow your diet at my house, give you an upset stomach, or wish you didn’t eat the things I cooked for you. I really want you to leave my house nourished, full and feeling good about what you ate. During my brief stint as a private chef, I enjoyed the families I worked with that had food sensitivities. I loved having strict guidelines to cook within. But more than anything, I loved giving my clients food that they hadn’t enjoyed in a long time due to allergies. Dairy-free ice cream was something I secretly tucked in the freezer before leaving their house. I want this coconut milk based ice cream to be your new go-to recipe all summer long. Once a week, I like to make the ice cream base in the blender, and place it in the fridge until I’m ready to churn. Somehow, I manage to space out the steps of making ice cream from scratch over a few days so it doesn’t feel like a cumbersome task to me. Here, I use gelatin as a thickener in this dairy-free ice cream. 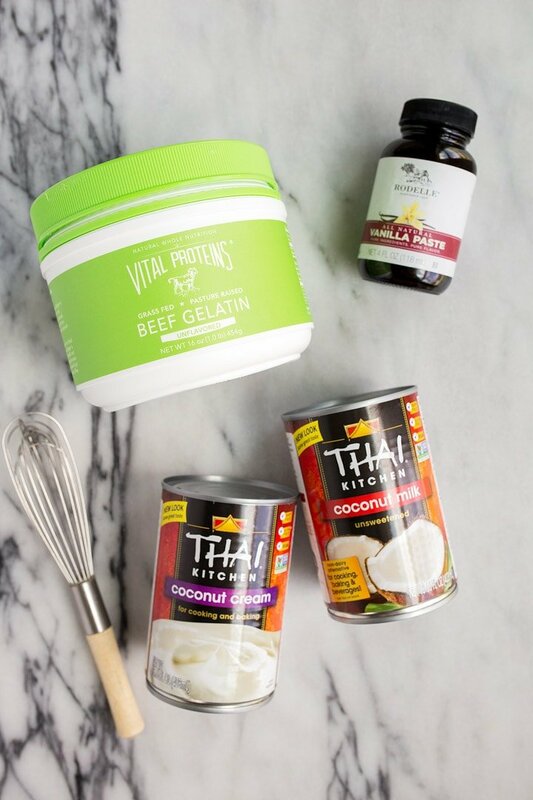 I grabbed my green can of Vital Proteins Grass-Fed Beef Gelatin, because it’s always in my pantry for making the most tender meatballs, homemade marshmallows, and homemade fruit snacks for my toddler. The gelatin provides a smooth, creaminess to the ice cream and prevents it from getting icy or hard in the freezer. Grass-fed beef gelatin also has health benefits, but let’s remember chocolate sauce and sprinkles are involved here today. I used 1 can of coconut cream and 1 can of full-fat coconut milk. It’s thick, rich and creamy. Yes, the ice cream has a faint coconut flavor, but the tablespoon-plus of vanilla bean paste makes it vanilla, too. Here’s the vanilla bean paste I love the most. One of the lesser known secrets of making homemade ice cream soft and creamy is sugar. And lots of it. You could get away with 1/2 cup of granulated sugar in this recipe, but a full 3/4 cup will give you the creamiest, dreamiest dairy free vanilla ice cream. Just go for it. If you make this coconut milk ice cream and customize it to your favorite flavor, I want to hear about it! Leave me a comment below so that we can all enjoy! Coconut milk ice cream is your best dairy-free ice cream. First, check your ice cream maker’s instruction manual to see if you need to freeze the bowl before making ice cream. In a blender, combine all ingredients. Puree on high for at least 2 minutes to fully dissolve everything. Pour the mixture into a 2-quart saucepan, and heat over medium heat while stirring frequently to dissolve the gelatin. Do not let the mixture boil. Cook it until small bubbles form around the edge of the pan, and a it coats the back of a wooden spoon like pudding. Place the mixture in the fridge, and chill at least 4 hours. Follow the ice cream maker’s instructions to churn the ice cream. Place the freshly churned ice cream in a freezer-safe container, and freeze for at least 6 hours, covered tightly. 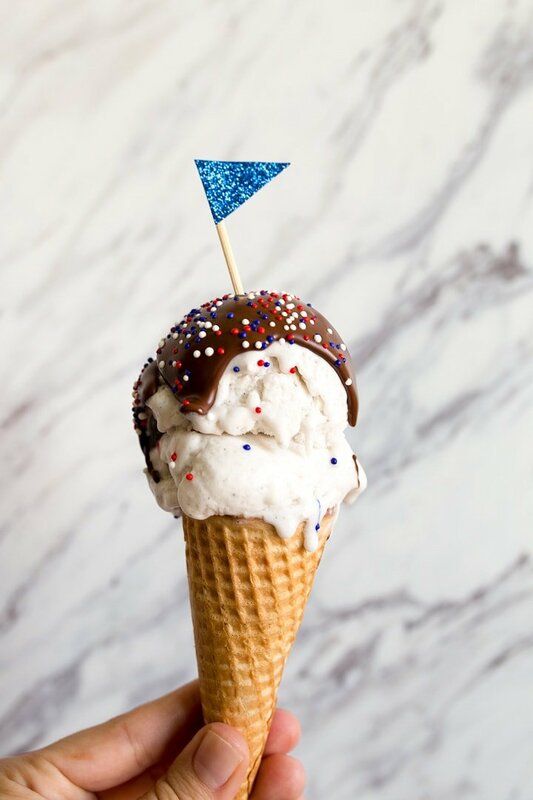 Let sit at room temperature for about 5 minutes before scooping and serving in a cone with chocolate sauce and sprinkles (entirely optional, but why not). Totally just made the base!!! I’m super excited to mix in a rhubarb purée/jam in it. I love making rhubarb ice cream, but i have been feeling so much better being dairy free!! Cannot wait to try this later!! So exciting, Marisa! Let me know how it turns out! I, too, love rhubarb! Can this be made without gelatin? 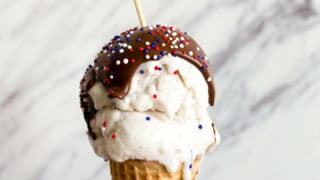 I’ve been wanting to try making homemade ice cream and this looks delicious!! What ice cream maker do you use? I can’t have sugar. Will honey work? I think you could use 1/2 cup of sugar + 1/4 cup of honey, but I don’t think all honey would work. But I’m not sure, I only tested the recipe as you see written here. Have you ever googled all-honey ice cream recipes? I think it can be done! I’ve made vanilla icecream and other frozen/refrigerator desserts with honey. If want the honey to not overpower the other flavors, I’ve found that particular raw honeys that are lighter in flavor (like lemon blossom, orange blossom, clover, or rosemary) work best. With these honeys you usually can’t even tell it’s made with honey. And all are happy, those with no dietary restrictions or healthy inclinations, and the ones who can only have honey. Thank you so much, Rhoda! So interesting! Would Splenda work with your ice cream recipe? I haven’t tried that, I’m sorry! It’s not a one-to-one ratio of sugar, is it? Hi! I don’t have the Vital Proteins gelatin but I do have regular gelatin powder…do you think that would work the same? Thanks! I’m totally going to give this a go this summer! My roommate and I are both lactose intolerant, but love ice cream! 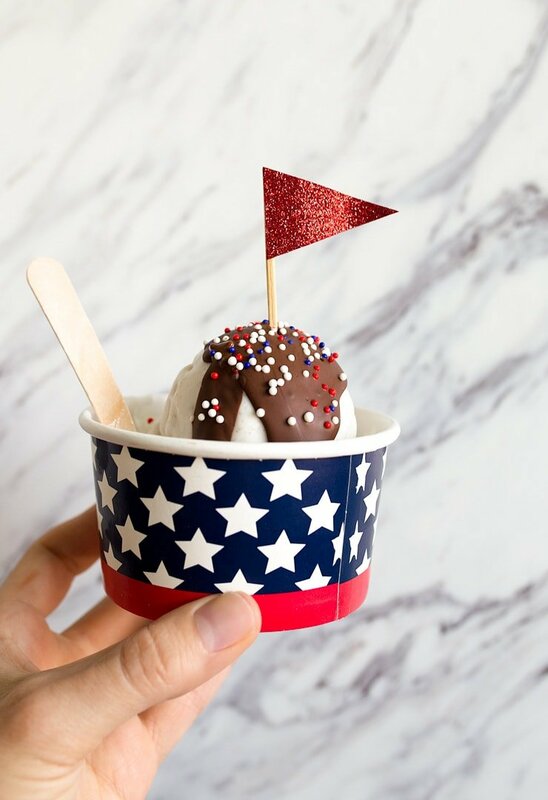 I am all about this dairy-free ice cream! Will be trying it soon! Made this tonight, and holy heavens, this is delicious!! So flavorful and creamy! Thanks for another great recipe! Sorry if I missed this, but do you have a recommendation on how to make without an ice cream maker? Or is having a machine a mandatory? Thanks in advance Christina! Omigosh I can’t get over how dreeeamy this looks! I cannot believe it’s dairy free! I’m mixing in fresh peaches from the peach truck tonight! Have you heard of the peach truck? They are based out of Nashville and have the BEST peaches. I’m so pumped to try it tonight! This sounds so yummy. But can you make without an ice cream maker, as I don’t have one. For the creamiest results, you need one. You can freeze it and then place it in the blender every few hours to break it up, and then re-freeze? I adore ice cream. But as I’ve grown older, I find I’m more and more lactose intolerant. I can’t wait to try this!!! And am dreaming of adding strawberries when in season. If I wanted to try mint chocolate chip, would I replace the vanilla paste with mint extract? Or keep it, adding in the mint?